Wow... Where has this week gone?! 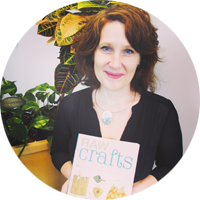 Since the Trade School Vancouver upcycling workshop I've been getting crafty, connecting with new upcycling peeps, mailing off packages to friends and then filmed myself for a TV show audition. Oh plus worked at both of my 'real' jobs. Phew! I had a fun afternoon today. 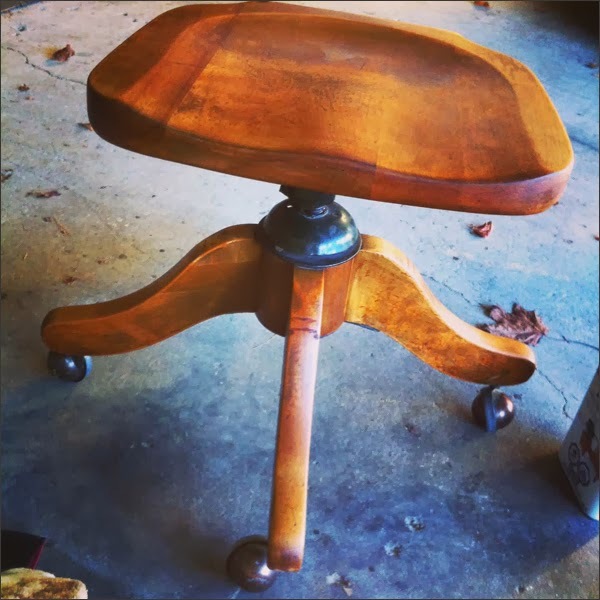 I worked on this gorgeous vintage wood office chair. One of last weekend's workshop participants dragged it in for me. I initially thought I would refinish it then give it away. But have since decided it's a keeper. 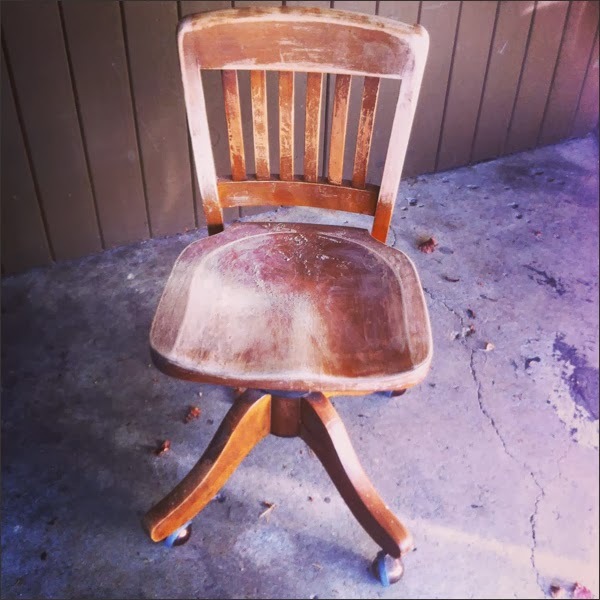 I'm getting rid of my current office chair and keeping this baby. Love how it's put together. 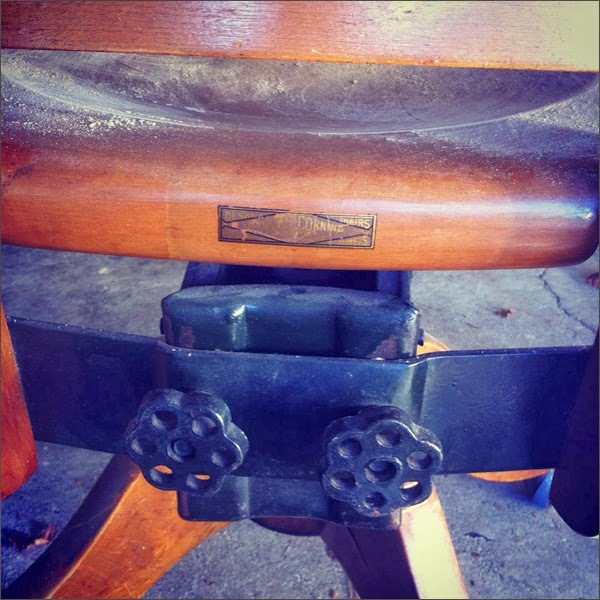 The back is screwed onto the seat. Nifty big metal parts. It's quite the heavy chair and you can see why! I first sanded then added tung oil and then rubbed in a darker stain to bring out the grain. Yay! There is one minor blemish. I've added wood glue and am letting it dry over night. Tomorrow I can put it in its new home plus get rid of my old office chair which has already been posted to Craigslist for free. I've been receiving a few kewl donations these days. 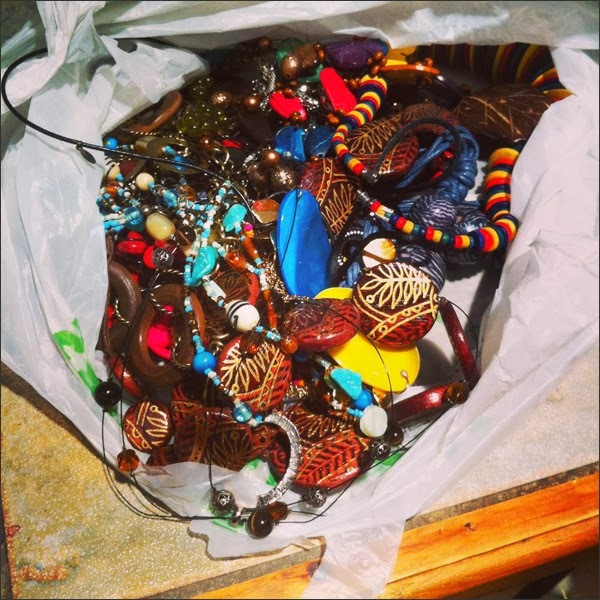 A coworker gave me this bag of junky jewelry to repurpose. I definitely think some of it could be used in my upcoming Xmas Crafternoons. Speaking of jewelry, I mailed off a few packages to friends. Sharing the crafty love! You can see why I'm really bad at that whole Etsy thang - I'd rather give my stuff away. More fun! 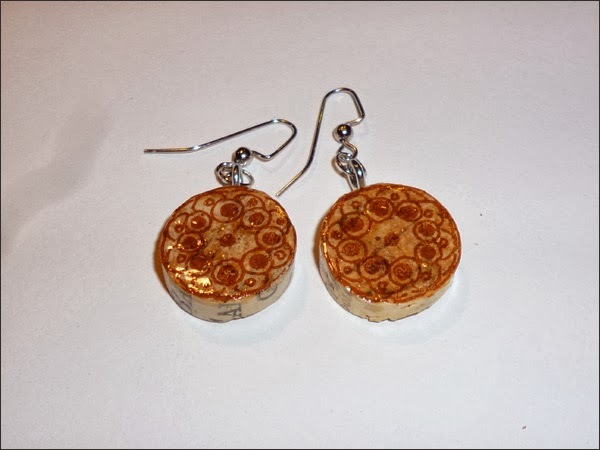 I'm also working on some metal washer and wine cork jewelry for a fundraiser at work. I am a multitasking goddess! What else? 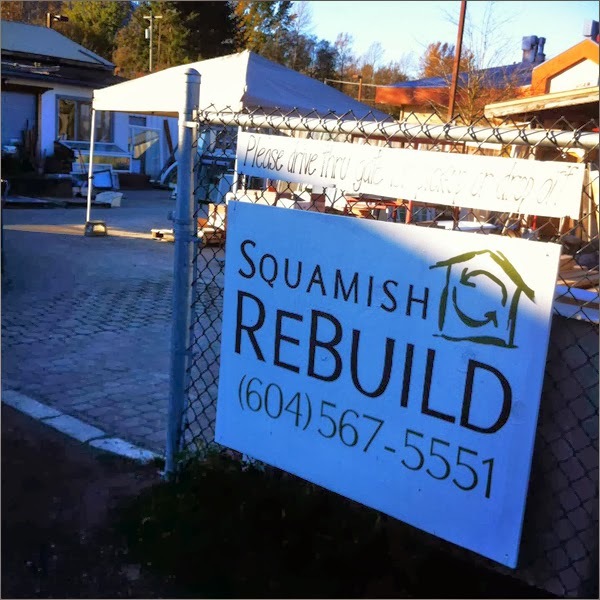 This week I met with Inis at Squamish Rebuild. 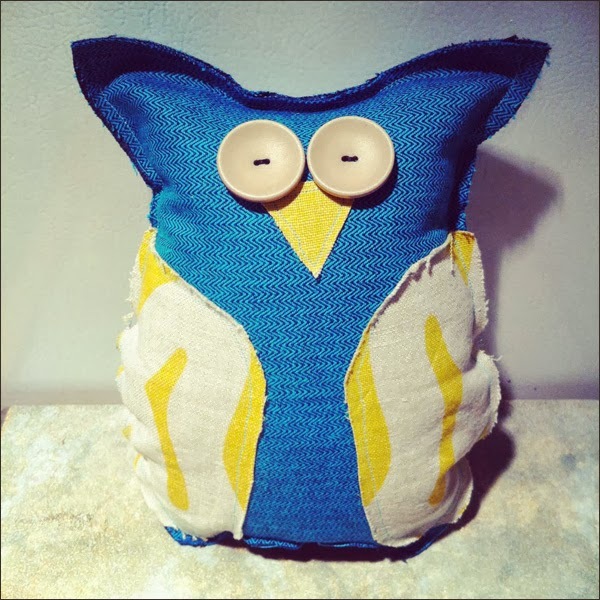 She's my new crafty/upcycling peep. She gave me a tour, we shared ideas, inspiration, etc. She's a keeper! Here's hoping we make great things happen together! 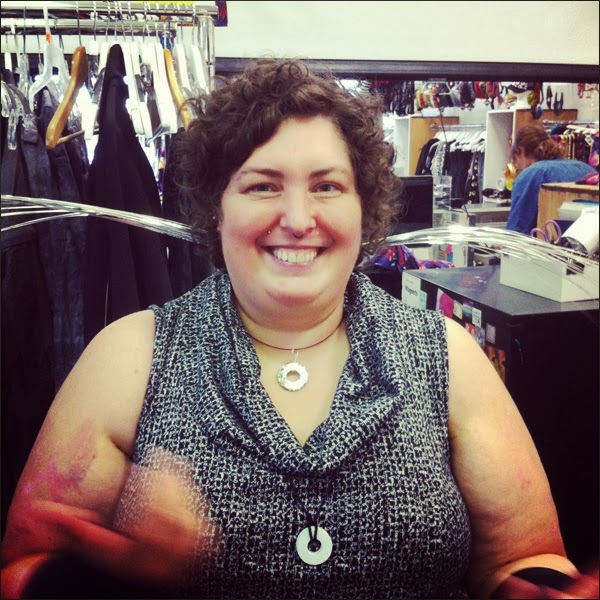 So much fun to meet new crafty peeps. Meanwhile in random crafty happenings, I was approached about applying for a documentary TV series (aka a reality show). 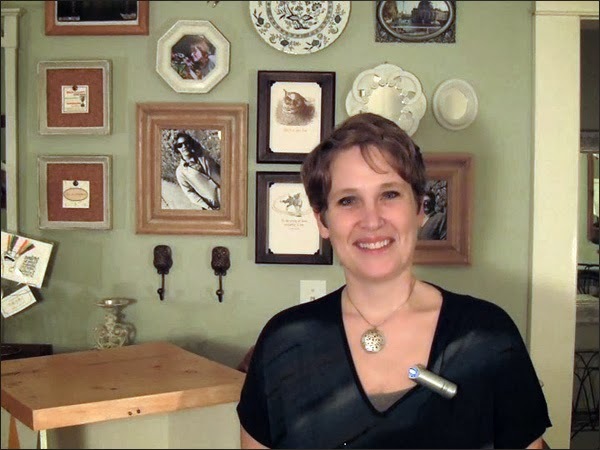 So I had a phone interview and then this week I sent in a little video about me, craftiness and Thrifty By Design. Life can be so random, full of nifty surprises and possibility. We'll see what happens! I did get my extremely gregarious Dad to give them a sales pitch cause that's what we do. 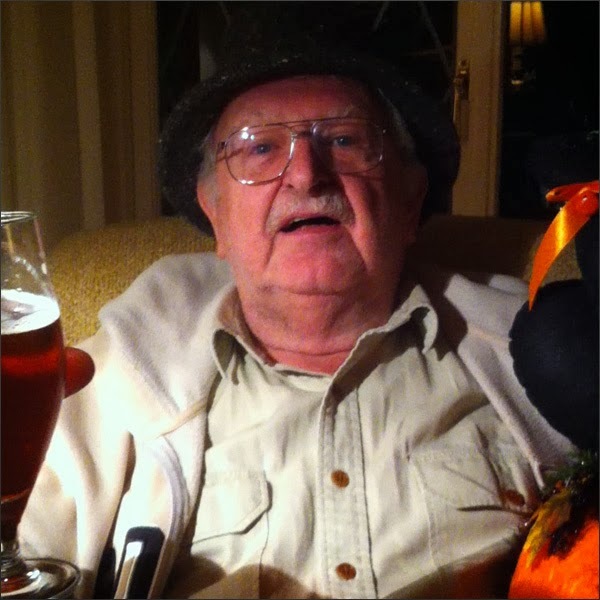 Love my Dad videos - they're pretty priceless. Dating advice, words of wisdom, etc, etc, etc. And he's always up for it! I really appreciate my BFF Mike... He helped direct the video. What a strange experience but I'm happy to take a chance, be fearless and let life happen. Bring it on! Keep your fingers crossed... Might be a super fun adventure. We'll see what life has in store for me. Yippee! 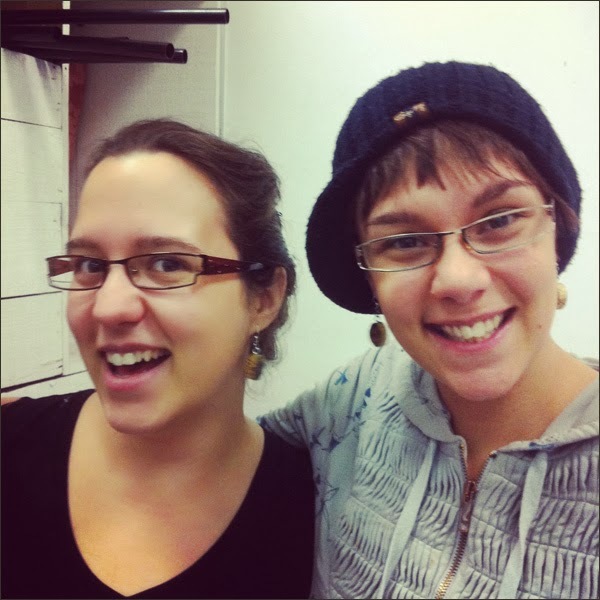 Had a super duper fun time at the Trade School Vancouver workshop at Blim. I was a bit bummed since it didn't fill up but it worked out for the best. I had super kewl crafty peeps come along, bring goodies and make stuff. I dragged a ton of supplies downtown for the workshop including my fancy dancy Singer sewing machine. Here's my new crafty friends making their outfits. My buddy Beatrix showed up. 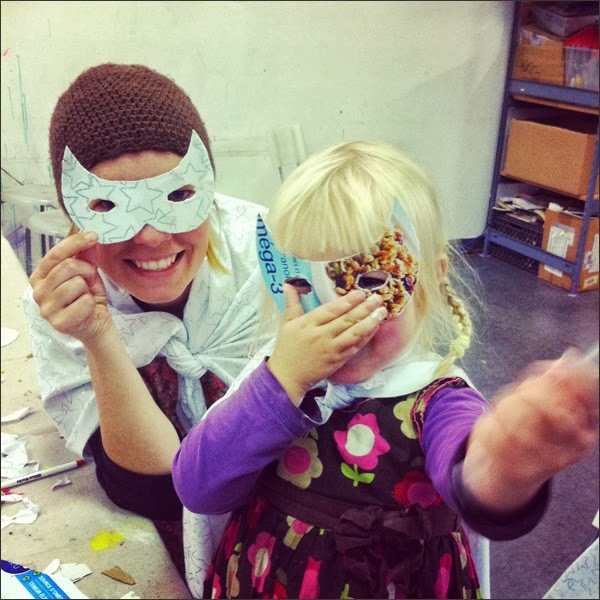 Her and her Mom, Charlotte, made capes and masks. I gave Beatrix my magic wand. She granted a wish for me. So sweet! 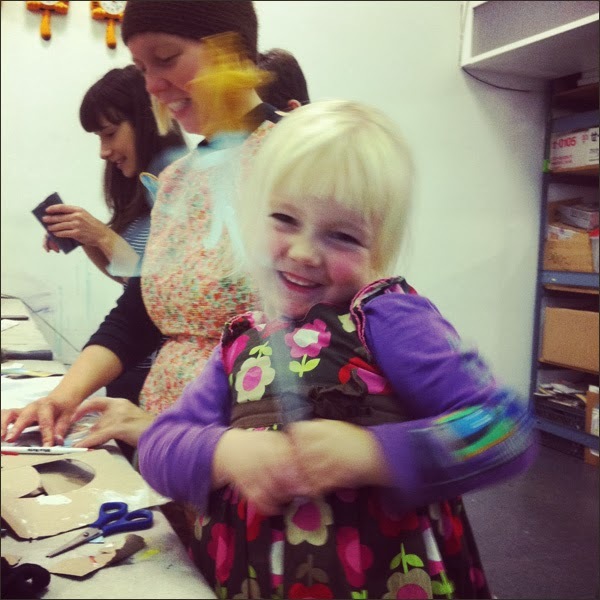 Adore happy crafters... I gave her one of my metal washer pendants. Gotta share the crafty vibes! 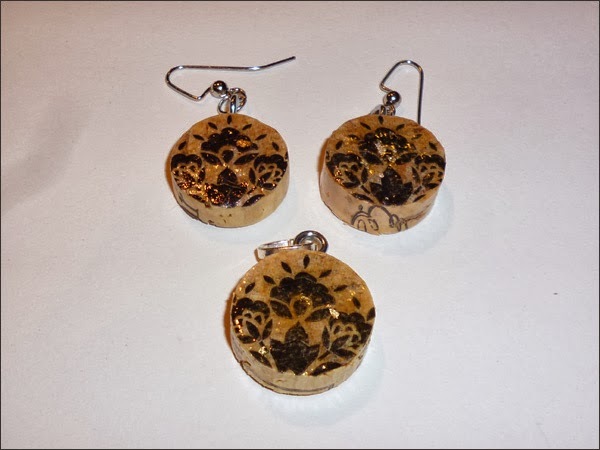 I gave these girls some of my wine cork jewelry which their sporting in this pic. 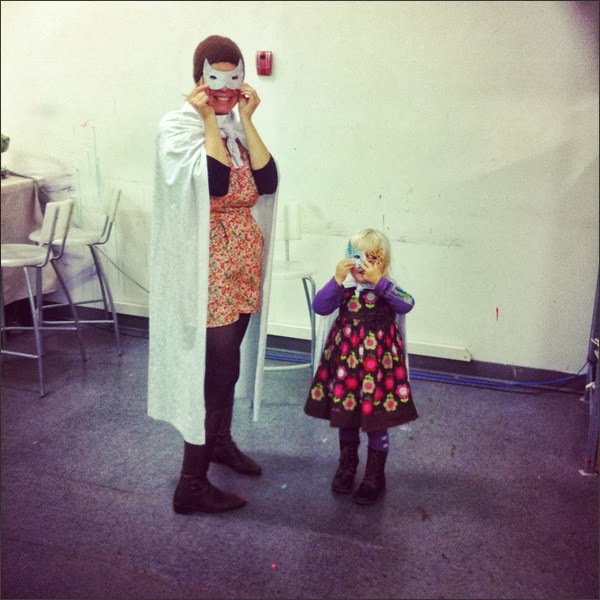 Beatrix and Charlotte in their capes and masks. They're looking pretty darn kewl! Here's a close up. Beatrix is waving her wand. She was pretty sparkly and magical. 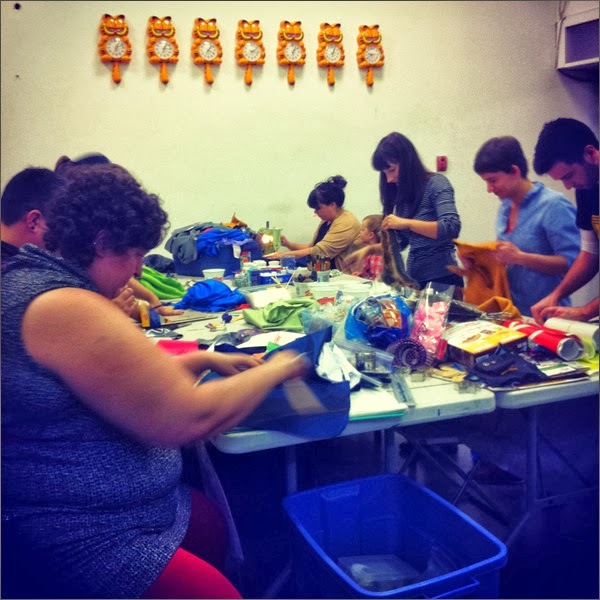 Big thanks to Trade School Vancouver for setting up the workshop, etc. Such a great idea!! Definitely worth trying a workshop or giving one. Why not! Also thankful to Blim for opening up their space. It was an amazing experience! Well it's Sunday night... What happened to the weekend?! Holy smokes! I was busy getting crafty... 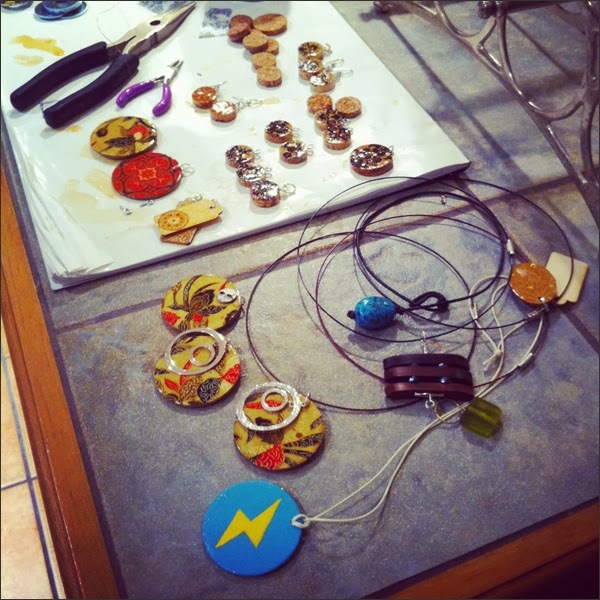 I had an assembly line of projects - workshop prep, jewelry making, etc. I am super duper pooped! I was a bad blogger though. I didn't take photos of everything! Just a few here and there. Oops! I decided to make masks for the superhero workshop. 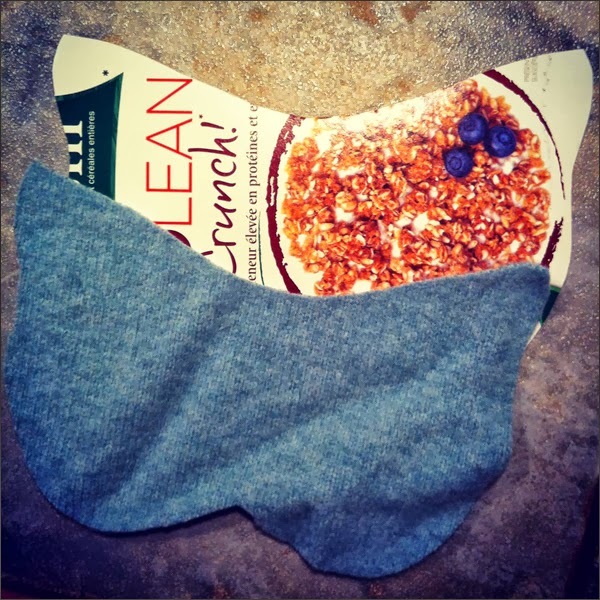 One out of felted wool and one out of a cereal box. 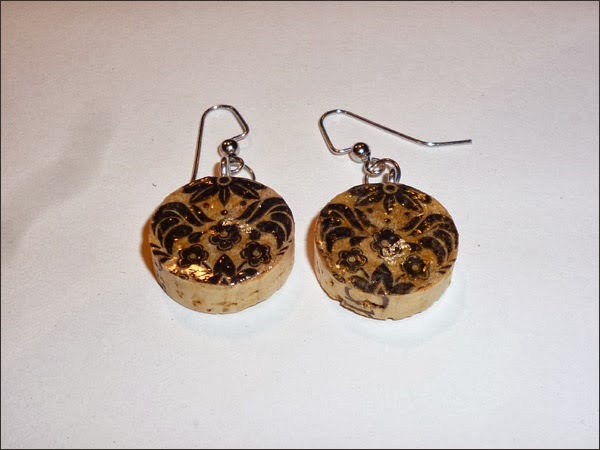 While I was getting some workshop prep done I also made jewelry. 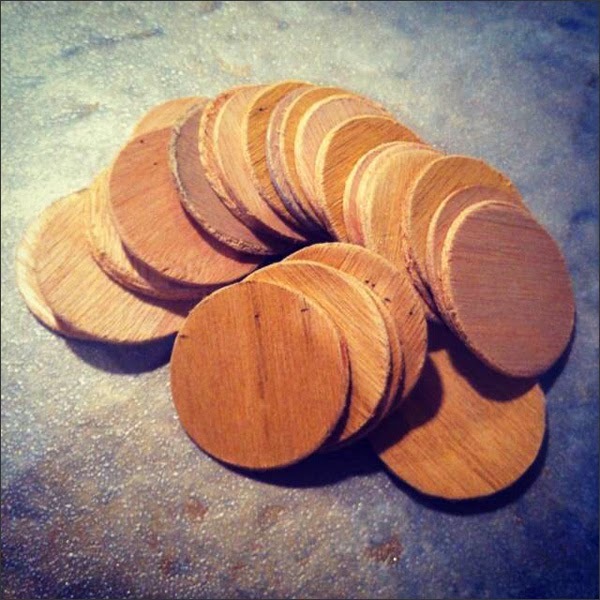 I had a friend cut up more wood rounds for me. I wanted to make a set of pendants for me and my BFF in Ottawa. Here's the start. 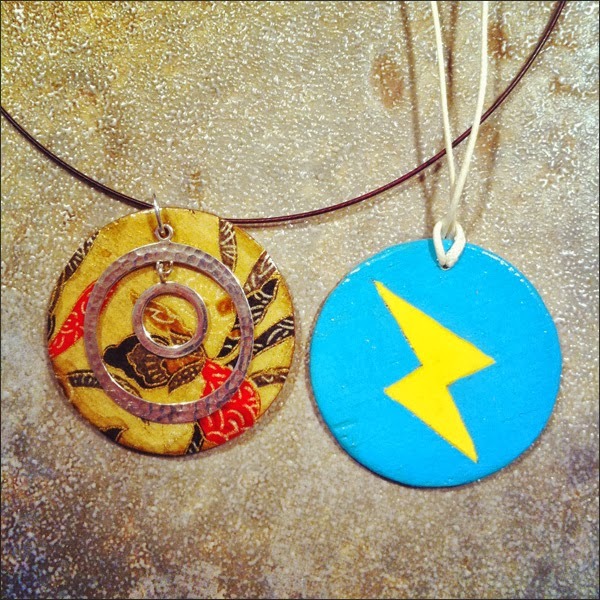 I also made a superhero pendant. 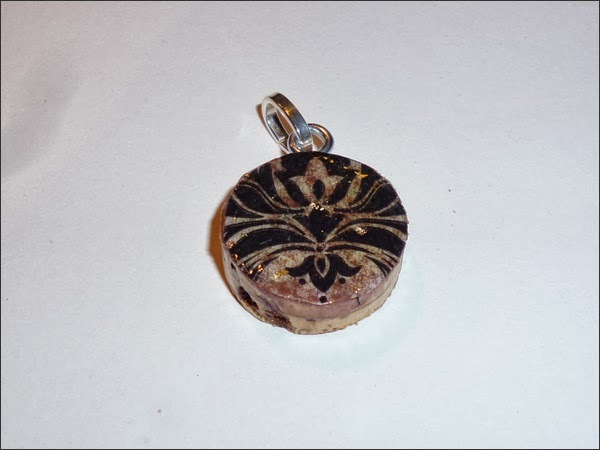 I added coffee to these pendants to stain them... Maybe make them look old. Just one of those weird things you try for some reason yet unknown. 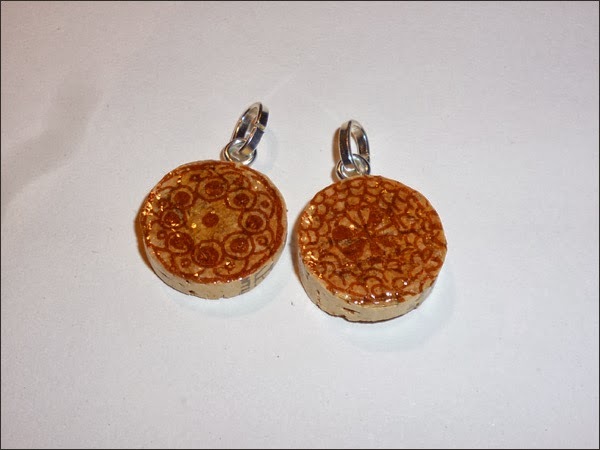 Here are the matching pendants. Pretty! This set of pendants is going in the mail tomorrow. One for my BFF and the other for her son Cooper. 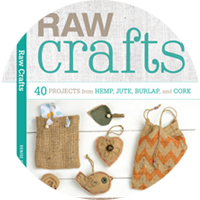 Fun to spread the crafty love! 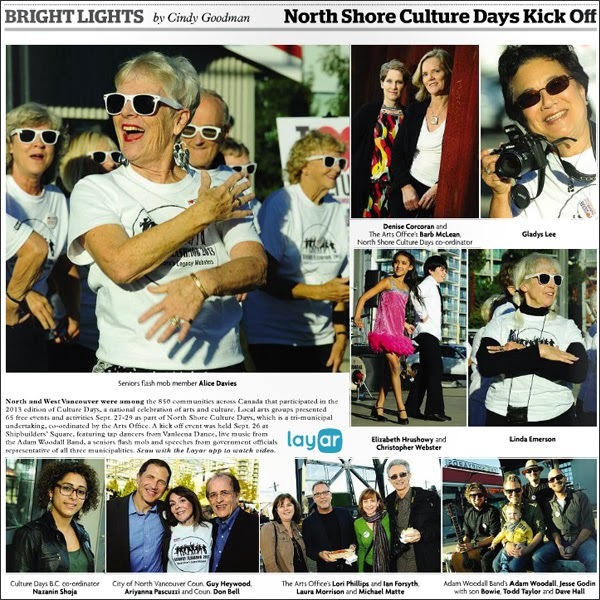 The last bit of Culture Days promo is out... Cindy Goodman from the North Shore News dropped by the North Shore Culture Days kick off in Shipbuilders' Square on September 26th. She got some great shots! Barb McLean from the Arts Office MC-ed the event. She did a FAB job! I spoke briefly... I was sandwiched between the cutie patootie tap dancers and the high energy Flash Seniors Mobsters. I think I held my own - both were pretty spectacular acts to be partnered with. 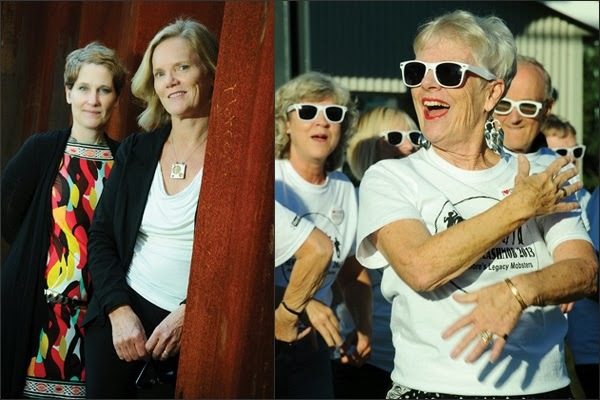 A few classic moments like my fabulous friend Alice showing her stuff as part of the Seniors Flash Mobsters were captured. Here I am with Barb in my lucky dress... I paid $7 for it and every time I wear it something kewl always happens. And Barb is wearing one of my jewelry projects. Yay! Check out the full photo gallery at www.nsnews.com. That's it for Culture Days promos, features, etc. Until next year! Happy to still be the BC Ambassador. It's been a wonderful gig! 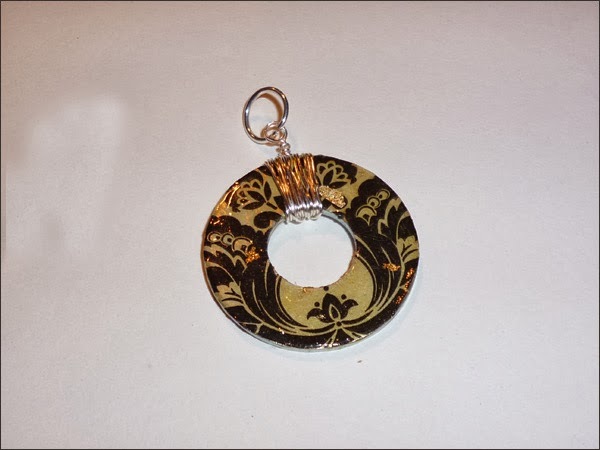 And then I added silver wire to another metal washer pendant. 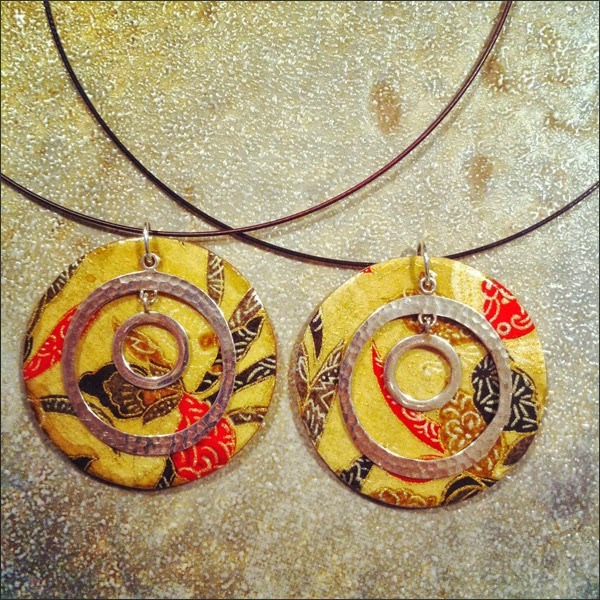 I'm cranking out the 'junk' jewelry these days! 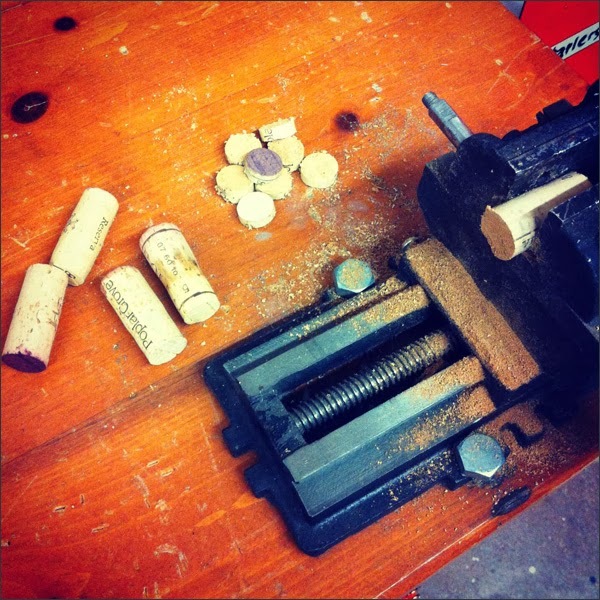 So I've got wine cork jewelry in the works and now I have some scrap wood pendants in the works. 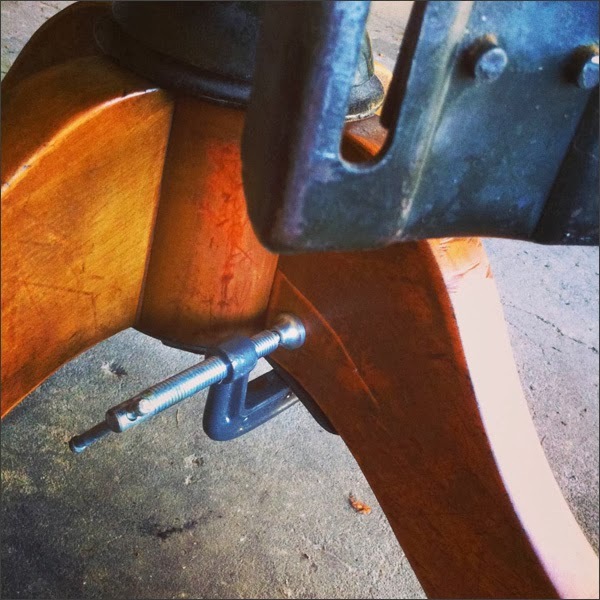 Friends with power tools rock! 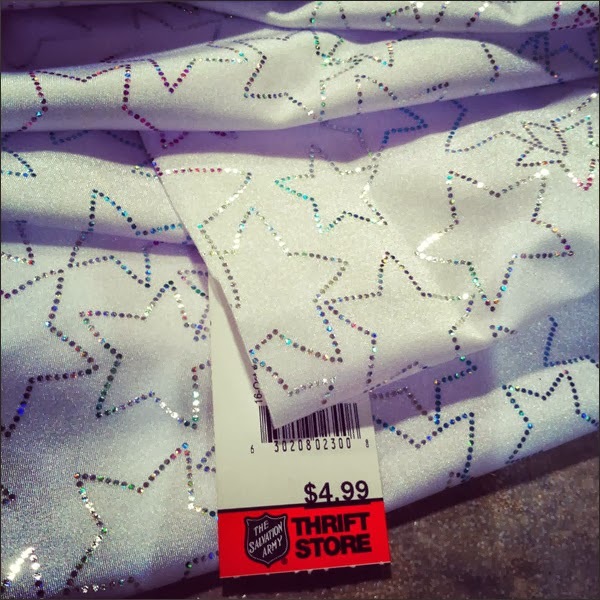 On a side note I've been scoring at the thrift stores these days. Here's my first stash of goodies. I found these visa the Lions Gate Thrift Store. 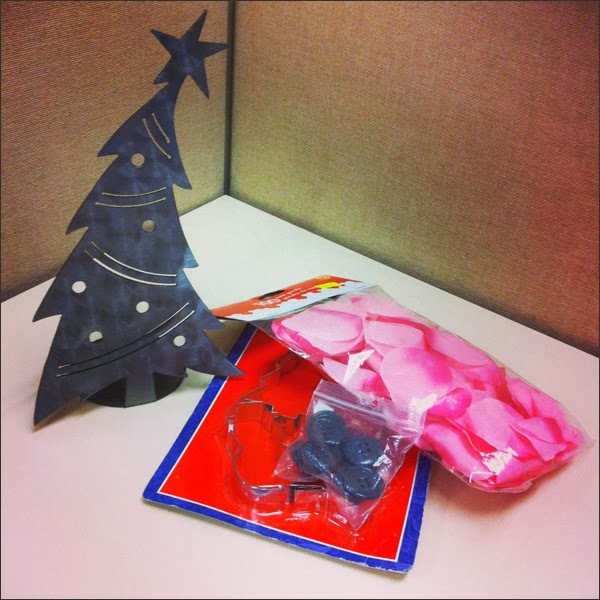 I've started collecting Xmas items. Love my Dr. Seuss Xmas tree! I found this super kewl fabric - it's perfect for my Halloween costume making workshop this weekend! And then more funky frames. 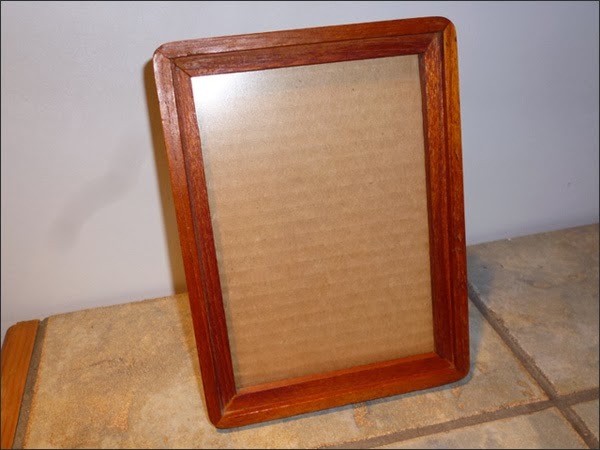 I found this teak frame for $1. 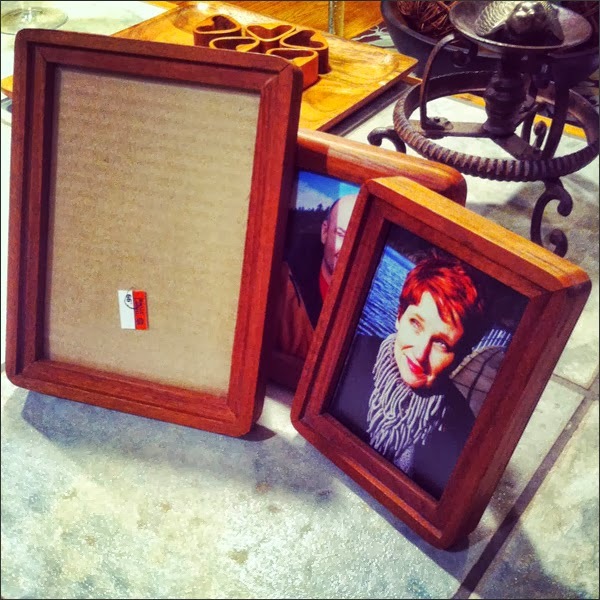 It totally matches with the other teak frame thrift store scores I purchased months ago. Yay for me! 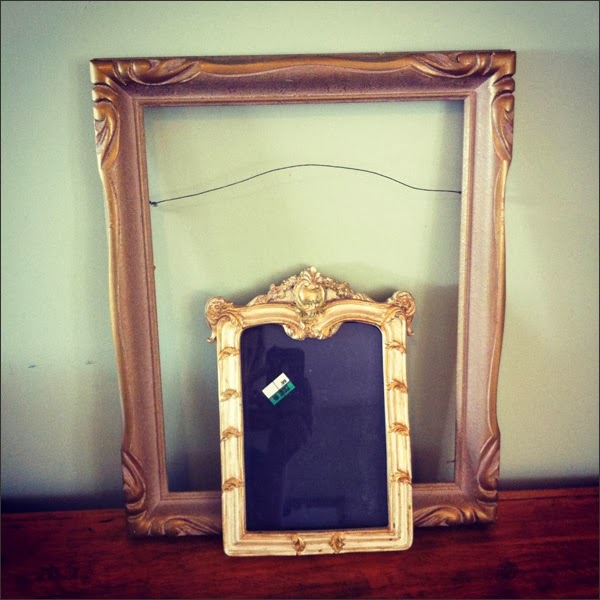 I quickly sanded my new frame then used olive oil and a rag to finish it off. Now to print a photo for it. Easy peasy! Tomorrow I'm working on masks, capes, etc. Lovin' being crafty these days! Nothing says superhero like adding stars to a project. 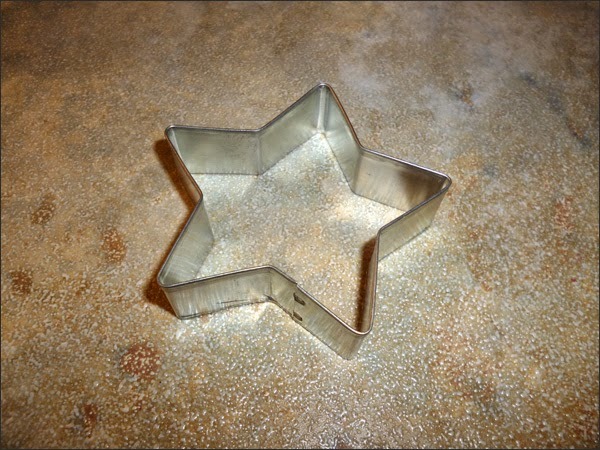 Here's my handy dandy star cookie cutter. I'll be using it for a few of my superhero projects... It also comes in handy for Xmasy projects. Those are coming up fast! 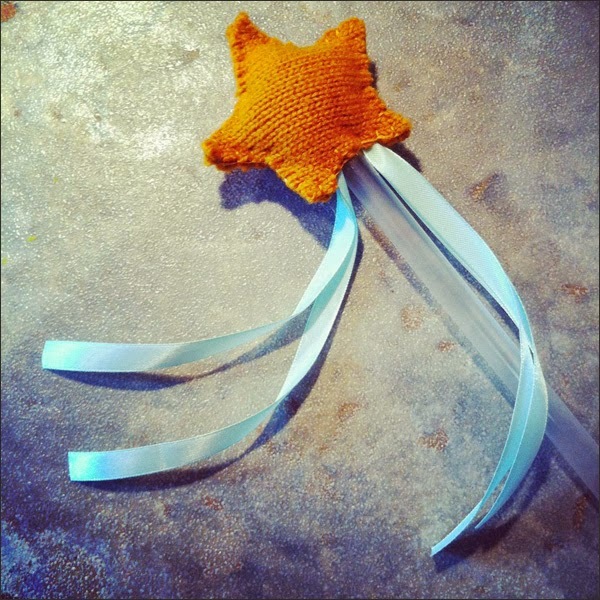 First upcycling project using the star is making a magic wand using an old wool sweater, ribbon and a plastic tube from a bouquet of flowers I received awhile back. 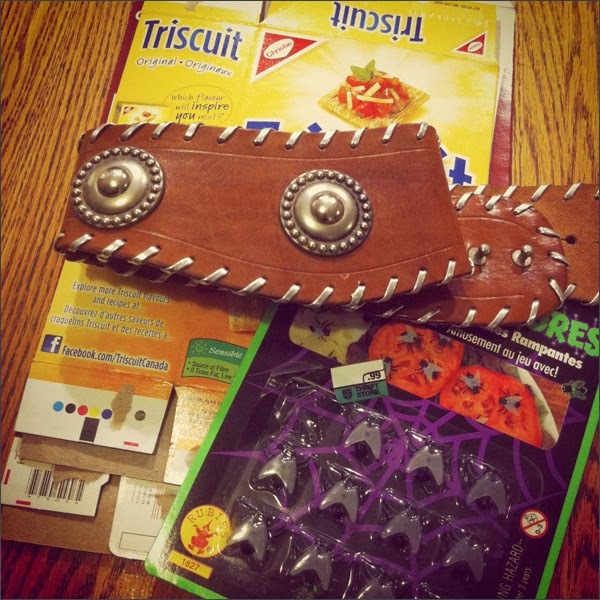 Yup I have my hoarder moments where I stash weird items away to repurpose. Or so it seems! 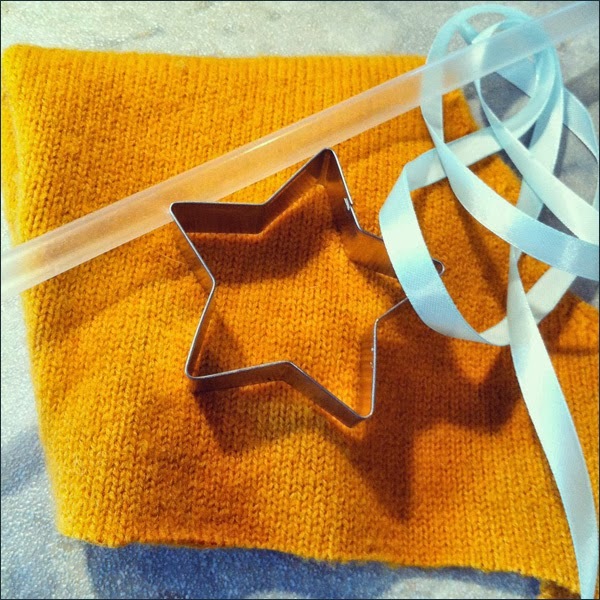 I cut out the stars then stitched the ribbon to the inside of the wool to ensure it stayed in place. I then stitched the stars together and added eco fill. Finally I used a bit of white glue on the plastic tube hoping it'll make the star sit securely then added the star. Done! Feeling very sparkly and magical! 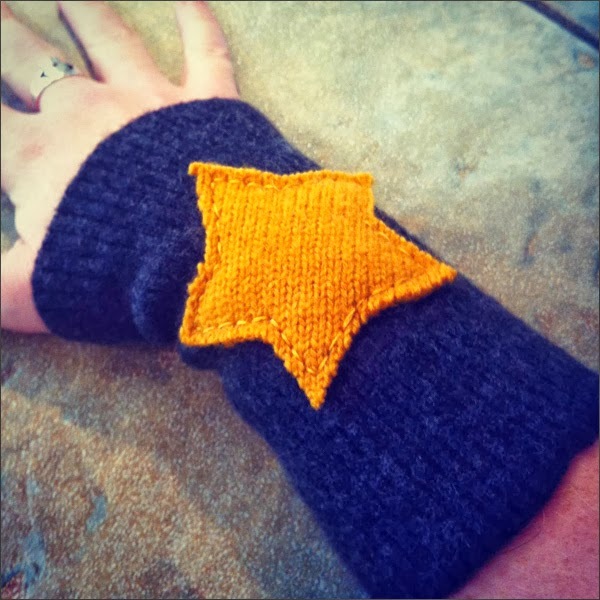 Here's my other project using old wool sweaters and the star - superhero wristbands. Another easy peasy project! 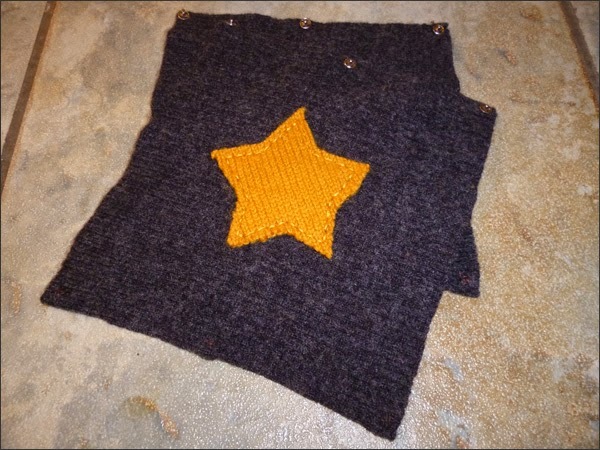 I stitched stars to the grey wool then added buttons to the side. Here it is! Now I'm feeling powerful. And kewl of course! 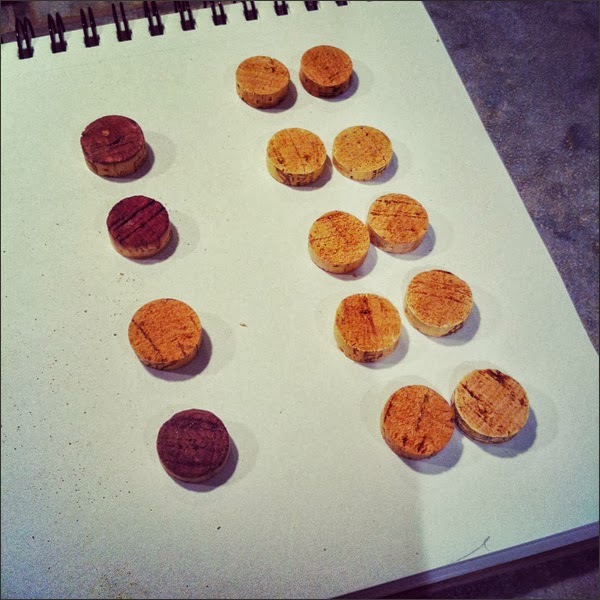 In other crafty news I have an assembly line of wine cork pendants and earrings in the works. 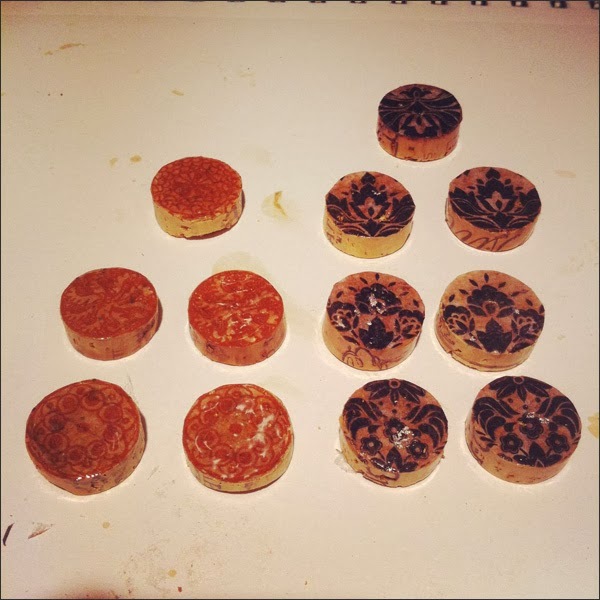 I took a breather from superhero projects and cut up some cork rounds. 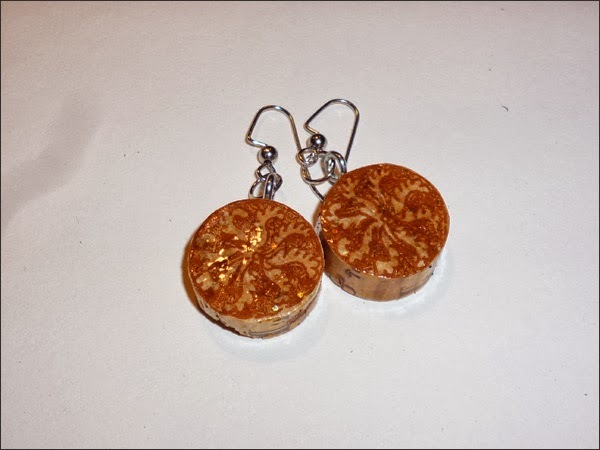 I have quite a few stockpiled since I only worked on a few jewelry pieces. 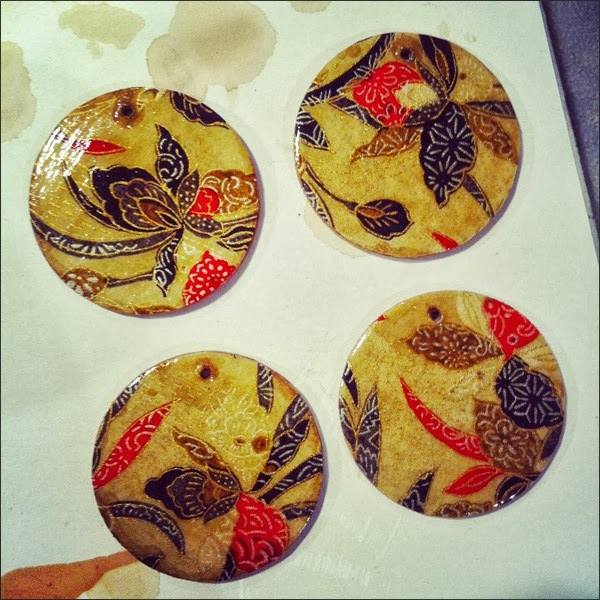 I managed to mod podge paper last night plus add a coat of wood varnish. 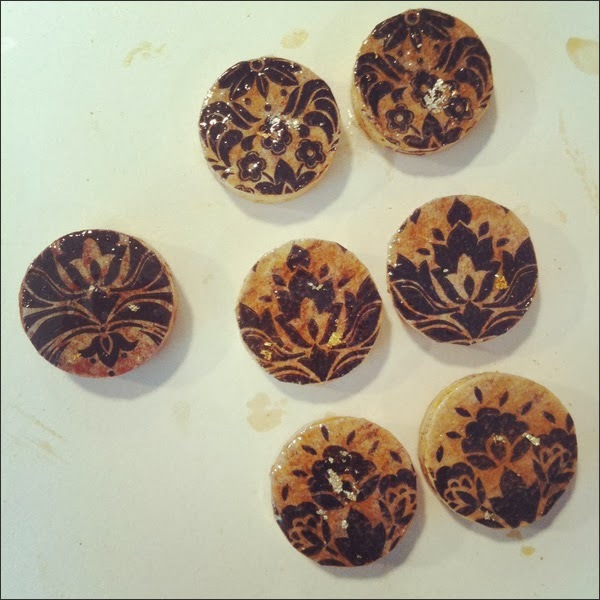 I think these ones are going to be gorgeous! Yay! Now to enjoy some lovely Fall weather, partake in a fabulous Thanksgiving feast and just be darn grateful for my family, friends, life, craftiness, etc, etc, etc. Happy Thanksgiving crafty peeps! Man I love sewing! Or at least creating things using my old Singer sewing machine. You can turn anything into something funsie. Last night I decided to be zen-ful and sew 'stuff'. 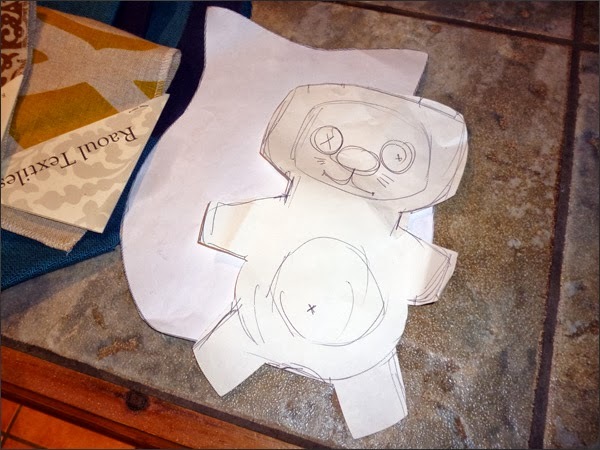 I wanted to make a few stuffies to give to friends so I pulled out my cat and owl patterns and got down to business. 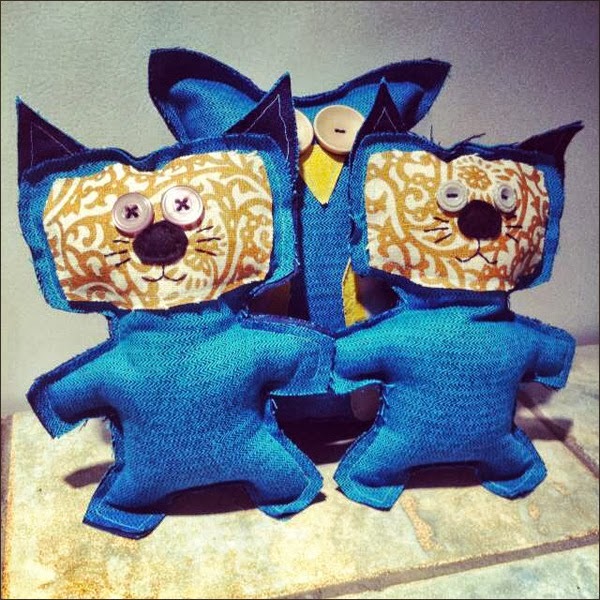 I finished off all three stuffies this morning - two cats and an owl. Cute! I used thrift store fabric for the body then fabric samples for the accents. 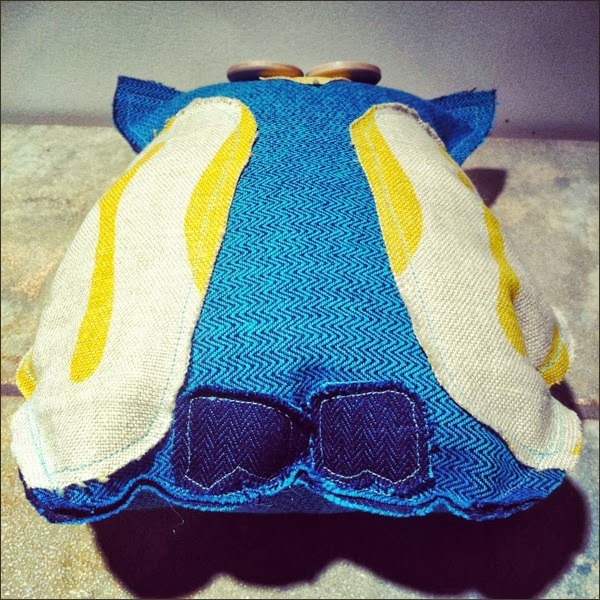 I first stitched the accents to the body then added eyes and noses. 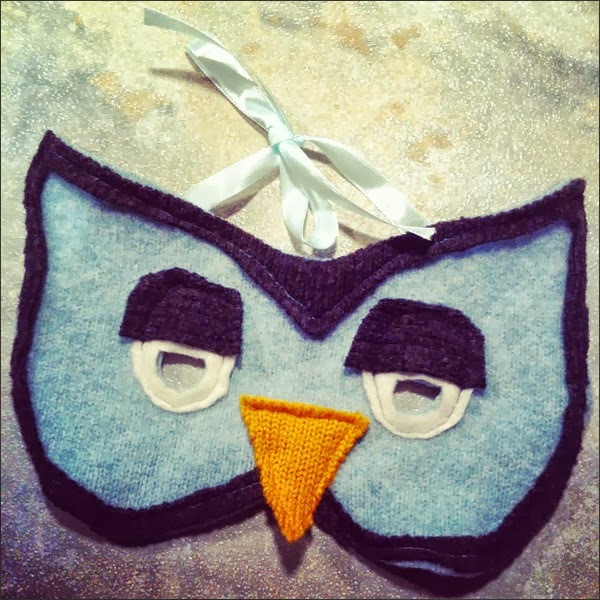 Here's my owl... 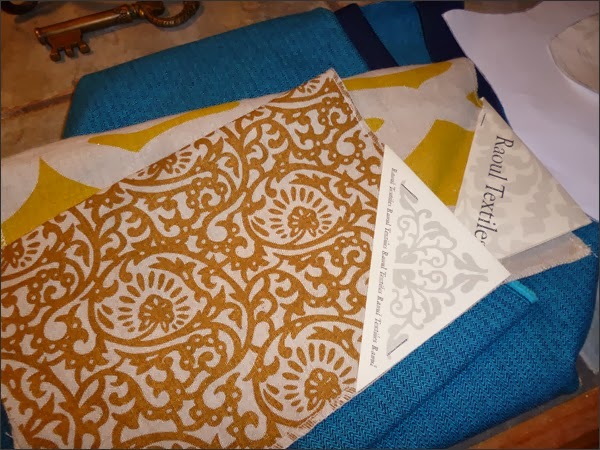 I love how the two fabrics look together! Look at those feet! I think the owl is super sweet! I may have to make another one or two! And here are my two cat stuffies. Easy peasy! 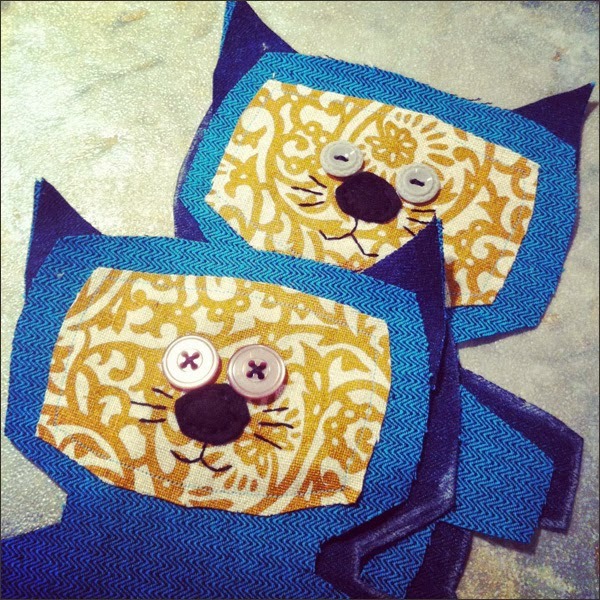 I just adore sewing sometimes! Other than that it's time to prep for my upcoming workshops. I've been collecting materials for the costume making workshop. I foresee a trek to Urban Source this weekend. 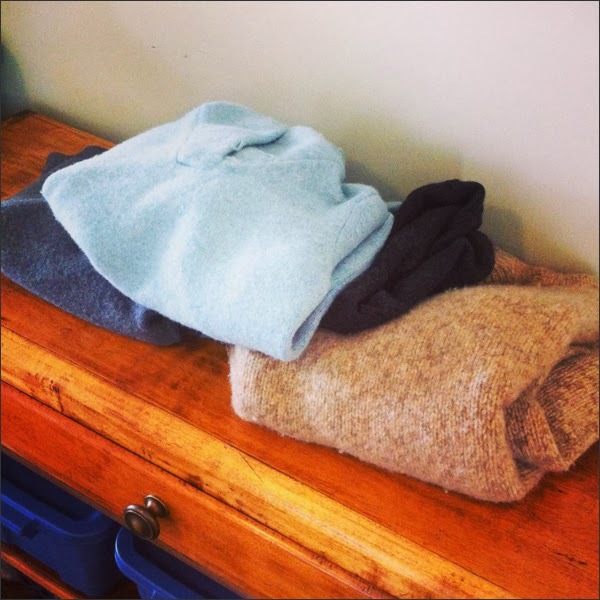 I scored some wool sweaters from the thrift store this week. 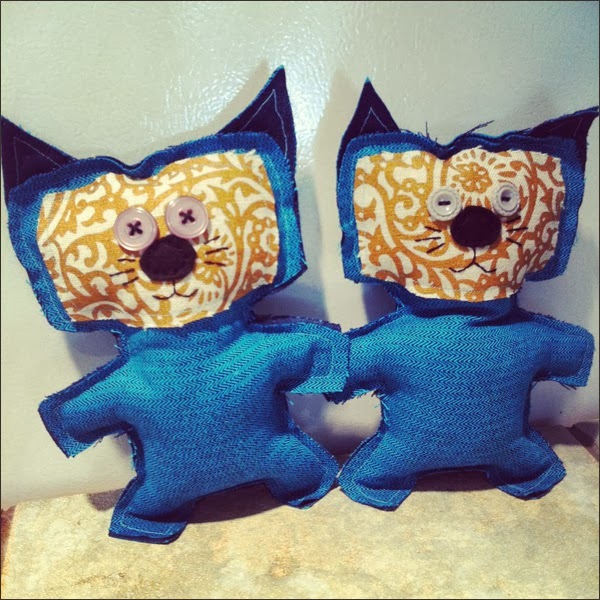 I felted these yesterday (a couple were already felted - I guess that's why they were at the thrift store!). 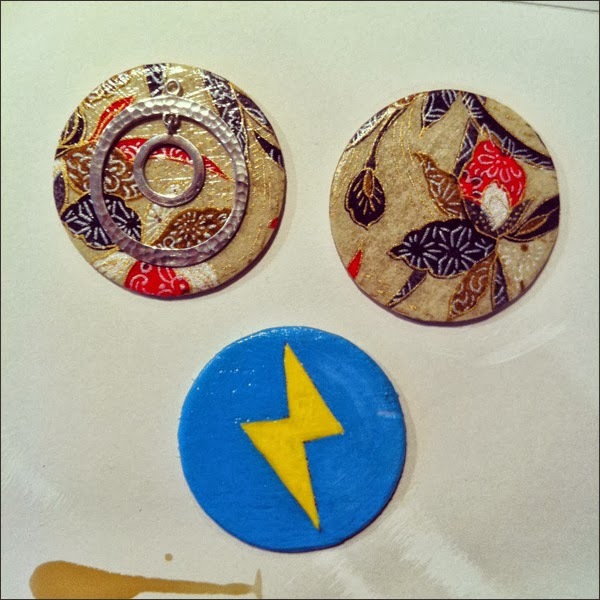 These will be good for the costume workshop as well as the Xmas Crafternoons. I've also started collecting Xmas items to be upcycled. 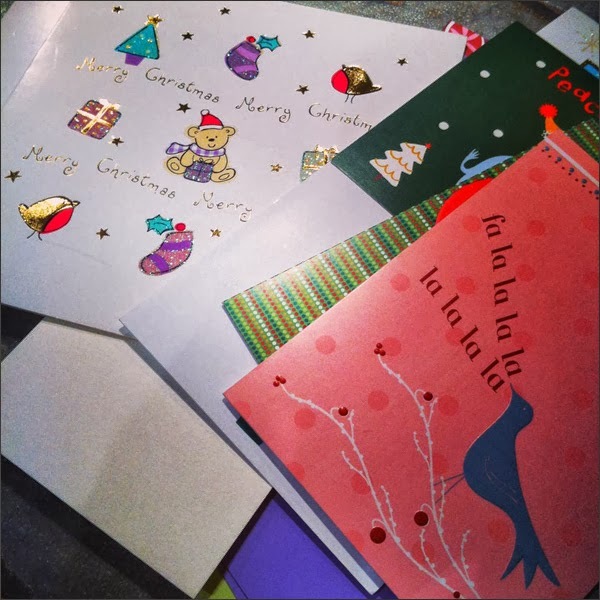 I bought a bunch of cards from the Lions Gate Thrift Store for $0.10/each. I may have three Xmas Crafternoons so need to have a bunch of materials stockpiled! And then I'm developing quite the stash of thrift store frames. I'm going to update these soon enough. I may give these away as Xmas gifties. We'll see! Now for another coffee and then more crafting! Yay! 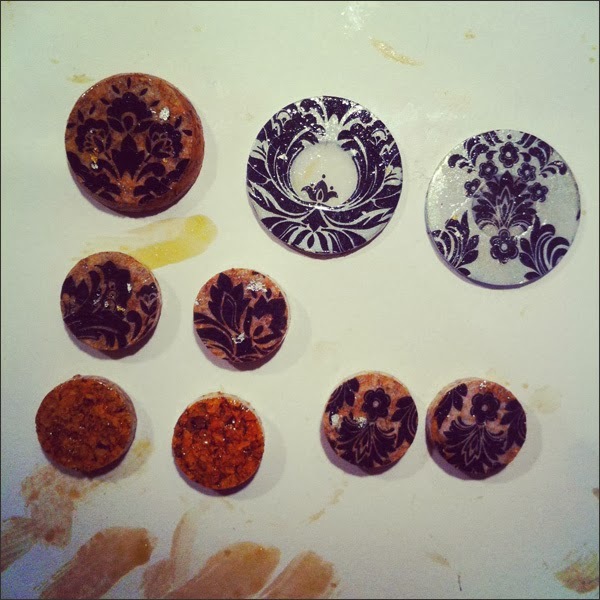 Button jewelry & rockin' the thrift store finds!